The Red Hat OpenStack Platform Director is a toolset for installing and managing a complete OpenStack environment. It is based primarily on the OpenStack project TripleO (OpenStack-on-OpenStack). The Director’s primary objective is to fully orchestrate a functional, Enterprise-grade OpenStack deployment with minimal manual configuration. It helps address many of the issues inherent in manually configuring individual OpenStack components. The end-result OpenStack deployment provided by the Director is called the Overcloud. The Overcloud houses all the components that provide services to end users, including Block Storage. This document provides guidance on how to deploy custom back ends to the Overcloud’s Block Storage service. Red Hat OpenStack Platform supports several third-party services, devices, and applications for functions ranging from block storage back ends to data processing. This release allows you to configure the Block Storage service to use Google Cloud as a backup storage service. This Google Cloud integration is available in this release as a technology preview feature. Technology Preview features are not fully supported by Red Hat. The deployment scenario described in this document should only be used for testing, and should not be deployed in a production environment. The overcloud has already been deployed through director, per instructions in the Director Installation and Usage guide. You have the username and password of an account with elevated privileges. You can use the same account that was created to deploy the overcloud; in the Director Installation and Usage guide, a user named stack is created for this purpose. The Block Storage service is installed on the Controller node; or, as is the case in an HA deployment, on every Controller node. 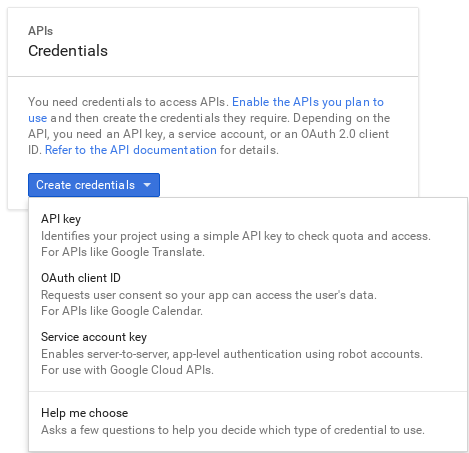 You have a Google account with access to Google Cloud Platform. This account will be used by the Block Storage service to access and use Google Cloud for storing backups. 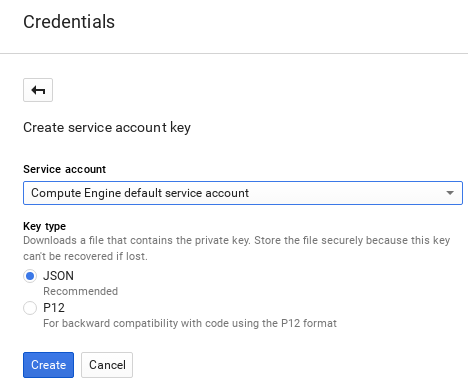 Creating and downloading the service account credentials of your Google account (Chapter 3, Create and Download the GCS Credentials File). Creating an environment file to map out the Block Storage settings required (Chapter 4, Create the Environment File). This environment file will also use the service account credentials created in the previous step. Re-deploying the overcloud using the environment file you created (Chapter 5, Re-Deploy the Overcloud). The following sections describe each step in greater detail. Log in to the Google developer console (http://console.developers.google.com) using your Google account. Click the Credentials tab. From there, select Service account key from the Create credentials dropdown. In the same screen, select JSON from the Key type section and click Create. The /etc/cinder/Cloud-Backup.json key will be used later in Chapter 4, Create the Environment File (in particular, the value of project_id and the absolute path to the file). Replace CONTROLLERHOST with the hostname of a target Controller. The environment file contains the settings you want to apply to the Block Storage service. In this case, the Block Storage service will be configured to store volume backups to Google Cloud. For more information about environment files, see the Director Installation and Usage guide. All Block Storage settings are configured in the /etc/cinder/cinder.conf file of the node hosting the Block Storage service. This file is divided into different sections, making it easier to manage different settings. PARAM is the setting you want to apply, and SECT is the section to which it belongs. CONFIG is the value you want to set to PARAM. The backup driver that the Block Storage server should use. For Google Cloud Storage, use cinder.backup.drivers.google. The absolute path to the service account key file you created earlier in Chapter 3, Create and Download the GCS Credentials File. The GCS bucket (or object storage repository) to use, which may or may not exist. If you specify a non-existent bucket, the Google Cloud Storage backup driver creates one using the name you specify here. See Buckets and Bucket name requirements for more information. The location of the GCS bucket. This value is only used if you specify a non-existent bucket in backup_gcs_bucket; in which case, the Google Cloud Storage backup driver will specify this as the GCS bucket location. See Bucket Locations for more information. The project ID of the service account you are using, as noted in the project_id of the service account key from Chapter 3, Create and Download the GCS Credentials File. The size (in bytes) of GCS backup objects. The size (in bytes) that changes are tracked for incremental backups. This value must be a multiple of the backup_gcs_object_size value. The HTTP user-agent string for the GCS API. GCS objects will be downloaded in chunks of this size (in bytes). GCS objects will be uploaded in chunks of this size (in bytes). To upload files as a single chunk instead, use the value -1. Number of retries to attempt. Storage class of the GCS bucket. This value is only used if you specify a non-existent bucket in backup_gcs_bucket; in which case, the Google Cloud Storage backup driver will specify this as the GCS bucket storage class. See Storage Classes for more information. List of GCS error codes. When creating new buckets, Google Cloud Storage charges based on your chosen storage class (backup_gcs_storage_class). The default NEARLINE class is appropriate for backup services. In addition, you cannot edit the location or class of a bucket once it is created. For more information, see Managing a bucket’s storage class or location. ControllerExtraConfig defines custom settings that will be applied to all Controller nodes. The cinder::config::cinder_config class means the settings should be applied to the Block Storage (cinder) service. This, in turn, means that the back end settings will ultimately end in the /etc/cinder/cinder.conf file of each Controller node. After creating the environment file, see Chapter 5, Re-Deploy the Overcloud for instructions on deploying its settings to the overcloud. If you passed any extra environment files when you created the Overcloud, pass them again here using the -e option to avoid making undesired changes to the Overcloud. For more information, see Scaling the Overcloud and Updating the Overcloud Packages.